To Cite: Poursadeghfard M, Raeyat M, Karamimagham S. Typical and atypical features in Posterior Reversible Encephalopathy Syndrome (PRES), Shiraz E-Med J. 2013 ; 14(3):212-216. Posterior reversible encephalopathy syndrome (PRES) is a reversible clinico-radiological condition with different etiologies. The typical findings are symmetric involvement of the parieto-occipital and posterior frontal cortex with sub-cortical white matter. But brain stem, basal ganglia and cerebellum can be involved as well. It sometimes progresses to atypical appearances including hemorrhage, contrast enhancement or diffusion weighted restriction. 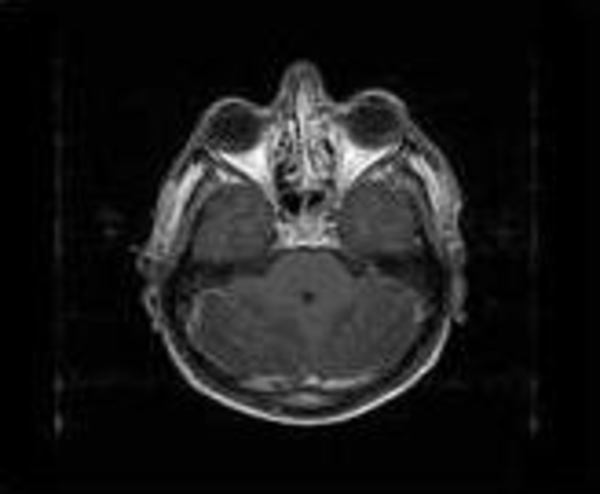 In this report, we introduce a young man who developed PRES after substance abuse with both typical and atypical features in the supra- and infra- tentorium areas and deep zones of the brain in magnetic resonance imaging. Involvement of all these areas of the brain together (supra- and infra- tentorium and deep parts) is uncommon in reports. Posterior reversible encephalopathy syndrome (PRES) is a reversible clinico-radiological condition with different etiologies (1). The common causes are severe hypertension, eclampsia, uremia and cyclosporine A neurotoxicity (2). It has a broad spectrum of clinical manifest tations as headache, blurred vision, seizure, encephalopathy and coma (3, 4). Pathophysiology is related to vasogenic edema in the brain especially in the cerebral white matter due to hyper-perfusion state, and extravasations of fluid with blood brain barrier breakdown (5, 6). The typical findings in imaging are symmetric involvement of the parieto-occipital and posterior frontal cortexes with sub-cortical white matter. But the brain stem, basal ganglia and less commonly the cerebellum can be involved as well. It may progress to atypical appearances including hemorrhage, contrast enhancement or diffusion weighted restriction (6). 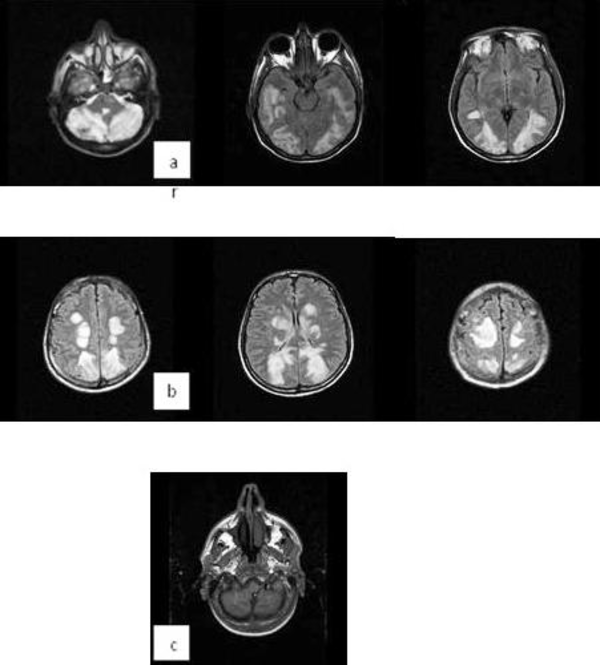 In this report, we introduce a young man who developed PRES after substance abuse with both typical and atypical features in the supra- and infra- tentorium areas in brain Magnetic Resonance Imaging (MRI). The patient was a 42 years old man admitted in hospital with a progressive decreased in the level of consciousness and comates state since the day before admission; in the hospital, he developed one episode of general tonic colonic convulsion. He had no history of epilepsy, hypertension, and trauma to head. Drug history was negative, but he was a substance abuser (alcohol, methadone, opium, crack and heroin). In examination on the admission time, he was localizing the pain, his blood pressure was 140/85 and his temperature was 38° centigrade. No any skin rash was seen, fundoscopy was normal, and meningeal signs were negative as well. He had no any lateralizing sign in neurological examination. Para-clinic data were as follows: blood sugar: 110 mg/dl, WBC: 8700/mm, platelet counts: 287 × 103 /mm, renal and liver function tests and serum electrolytes were completely normal, ESR: 9, CRP: negative, HBs Ag and HCV Ab and HIV Ab all were negative. Urinalysis and EKG were unremarkable. Lumbar puncture for pressure, cell count, protein and sugar were normal. Brain Magnetic Resonance Imaging (MRI) with and without gadolinium showed symmetrical hyper-intense cortical and sub-cortical lesions in both cerebral hemispheres along with the cortical watershed zones. There were also basal ganglia, brain stem and cerebellum involvement. Hemorrhagic areas in the cerebellar hemisphere were seen, too (Figure 1). MRI with gadolinium revealed patchy enhancement in both cerebellar hemispheres (Figure 2). Brain MR Angiography (MRA) and Venography (MRV) were normal. After 3 days, his level of consciousness and vision improved and in the 7th day of admission he was discharged with normal consciousness state and vision without any neurological deficit. PRES is a reversible condition manifested by a variety of neurology signs and symptoms. Its mechanism is presumed to be as hypertensive encephalopathy, but hypertension may not be present or may be very mild (7). In one study on 151 patients with PRES, 21.1% were normotensive, 13.2% had mild and 57.6% had severe hypertension. Hemorrhage was seen in all the 3 groups with a similar frequency except patients with allogeneic bone marrow transplant who had a high frequency of hemorrhage (8). In contrast to its name, PRES sometimes extend from the posterior to other parts of the brain such as the frontal and temporal lobes, basal ganglia, brain stem and cerebellum (9, 10). Our patient presented with involvement of all these areas of the brain (supra- and infra- tentorium) together which is uncommon in reports. Atypical features such as hemorrhage and gadolinium enhancement were also present. Indeed, these extensive signal changes occurred in a mild hypertensive state (blood pressure 140/85) without any history of previous hypertension. Many recent studies have reported less vasogenic edema in severe hypertension (mean arterial pressure around 137 mmHg) compared with normal blood pressure (mean arterial pressure around 95 mmHg) (11, 12). This fact recommends other causes for the progression to vasogenic edema in these patients (13). The authors would like to thank Dr. Zahra Zare for assistance in imaging interpretation and also Dr. Nasrin Shokrpour at Center for Development of Clinical Research of Nemazee Hospital for editorial assistance.